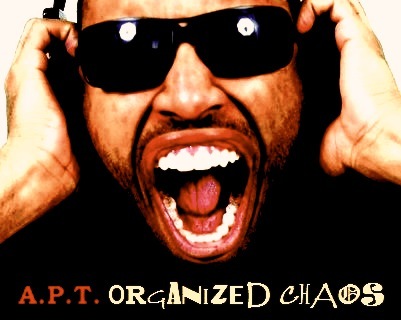 Be on the look out for my NEW album, “Organized Chaos,” available July 19, 2011! Help Me Get “NO U AINT” to #1 on Billboard!! I’m a guy who likes to dream big dreams. 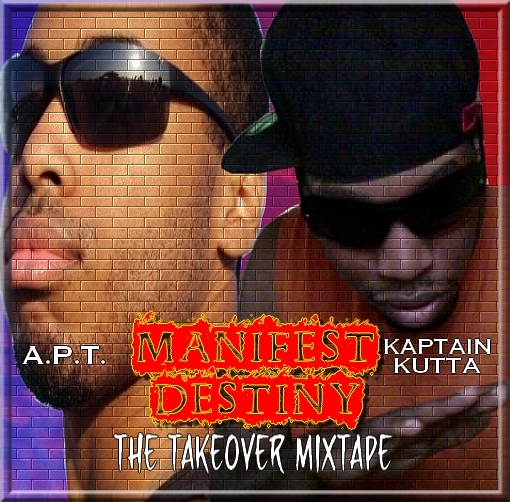 When I moved to Atlanta almost 3 years ago, I had a dream of getting my song played on radio. 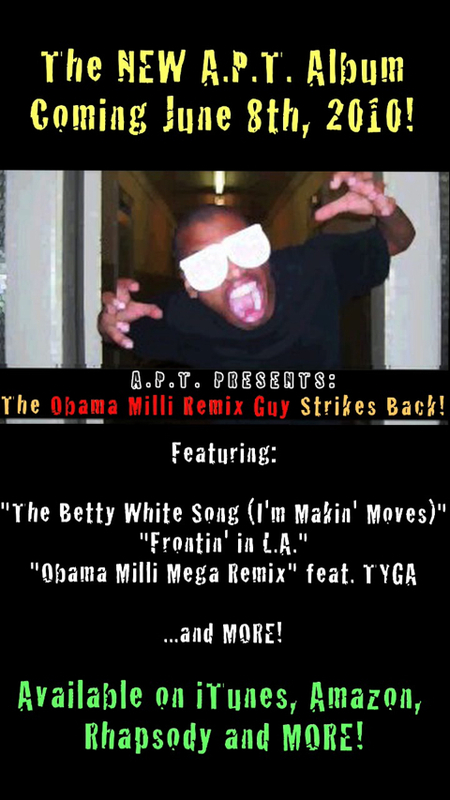 1.5 years later, my “Obama Milli Remix” song got real popular, and played on radio stations worldwide. Unfortunately, I didn’t know how to get my song to iTunes at the time, so it didn’t quite register on the charts. Now that I DO know how to do all that, I have one mission for the summer: to get one of my songs to the top of the Billboard and iTunes charts. Right now, my song “No U Aint” is getting the most favorable reaction – everyone I’ve played it for/every person who’s seen me perform it loves the song. The beat (produced by ATL’s own K.K.O.F.) is infectious, the lyrics are sing-songy, and it’s a sentiment everyone can relate to. I WANT THIS SONG TO GET TO #1, PEOPLE! As I have found, when you speak things into the universe, they tend to happen. Therefore, I’m saying it right now: “NO U AINT” WILL be a #1 song on the charts this year. I don’t know how I’m going to get it done, but it’s going to happen. I’m going to push the heck out of the song and send it to every radio station I can, and perform it at every venue I perform at until DJs start spinning it regularly and it starts to catch on. But mark my words, it WILL be a hit. REQUEST THE SONG AT RADIO AND IN THE CLUBS. Yes, call your local station and pester them until they play it; go to the club and hand the DJ a copy of the song. This is going to happen. It has to – it’s been typed out for the whole world to see. Let’s do it, people! Drake’s upcoming album, “Thank Me Later,” leaked. I’ve heard the album, and decided to review it. So, what did I think? Watch the video and find out! You can also order your very own “No U Ain’t” t-shirts for $20 (available in all sizes, in 5 different colors including Gold & Purple for all you LAKERS fans!!) – write me at Aaron@APTsongs.com and I’ll send you the order link! Get it today, and help spread the “No U Ain’t” movement! 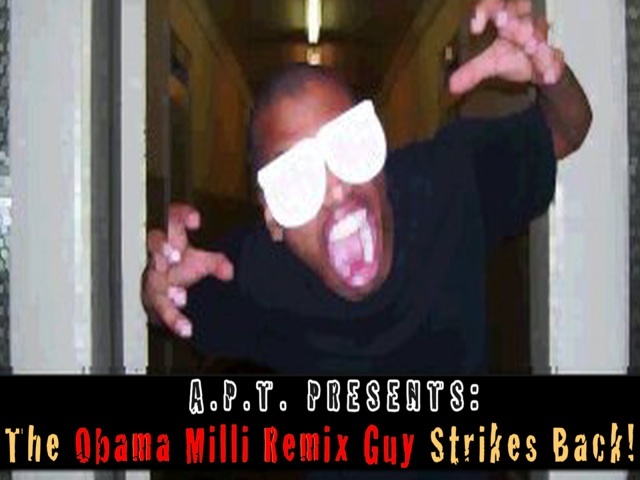 BTW: My album, “The Obama Milli Remix Guy Strikes Back,” comes out June 8! Now that the creating of my album is winding down, I’m starting to think of other ways I can make money. A wise man once said, “The best way to become rich is to figure out a way you can help a large group of people, then charge them for it.” In other words, the more people you can help out, the more money you are apt to make. Eh, who really knows. I think it has something to do with the fact that as you help more people, they start asking for more ways you can help them, and are usually willing to GIVE you money for doing so. I’ve experienced this myself before. Most recently, I agreed to help some colleges of mine advertise their “No U Aint” t-shirts by making a song/anthem to the slogan so that they could make some money. Granted, by making the song I figured I’d be able to make money off the sales of it, but I wasn’t in any way looking to profit off the shirt sales. Despite this fact, they said I’d receive a profit off every shirt I helped sell. Ultimately, it all goes back to the law of reciprocity: if you do something good for someone, they will usually want to do good to you so things will be balanced. With all that said, I’ve been thinking about what kind of blog I could create that would (a) give people a positive outlook for their day, and (b) become popular enough to get me internet attention from publishers so I could make some money selling books. I’ve seen a couple of people become successful doing this (i.e. “Stuff White People Like” and “1000 Awesome Things”), so I know it’s possible. I actually had a blog a couple years ago that I did this with called “Why I’m NEVER Having Kids,” but it’s kinda hard to think of reasons I don’t like kids on a daily basis, especially seeing as I do my best to stay away from them. So, I’ll have to think of some other idea that I can blog about and get rich off of. I know I definitely want it to be beneficial to people, but it also has to be something that has a catchy title, will make people want to pass it on to others, and is not so “me” focused like this blog is (which, of course, it has to be since it’s all about self-promotion). 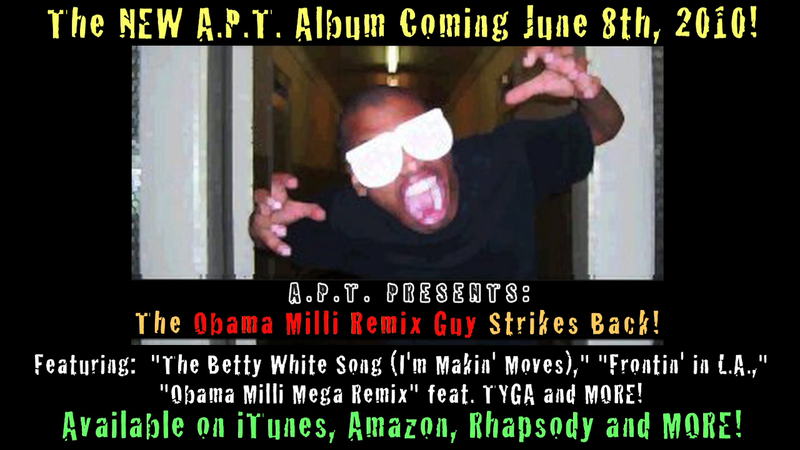 In the meantime, though, the album – “The Obama Milli Remix Guy Strikes Back!” – comes out June 8th! Only 2 more weeks until the album drops! In the meantime, I’m doing all I can to get the word out. Right now, that means focusing on two very important things: radio play and performances. The song I’m pushing for radio play right now is “No U Ain’t.” In my mind, radio stations SHOULD play my song because it’s a no-brainer. It’s a hot song, one that people can chant along to; lyrically, it’s not so difficult that people can’t memorize the words; people can relate to the sentiment of the song (namely, that someone who’s lying to them about how successful they are should be told the truth to their face – i.e. “No U Ain’t!”); the beat, courtesy of K.K.O.F., is a straight BANGER; and – most importantly – it’s got a T-shirt to go with it! With all of those elements, ANY radio station should be more than willing to play it. All it takes it just ONE station to play it just ONE time. It’s like that first domino – once it gets pushed down, all the other ones tend to follow suit. In the meantime, though, I’m well into the second aspect, performing. I performed some of my new two Saturdays ago and got a GREAT response. My next performance will be Sunday night at one of my friends’ birthday parties. Whereas the last performance was more of a “get back out there and start performing” show, THIS one is going to be even better. More people in the audience = more people being exposed to me and the song. I’m making CD copies of the single to pass out (the single will have a mini-sample of some of the other songs I have on iTunes as well), and my ultimate hope is that I’m able to get requests for more performances after this one. Plus, people will get to see me wearing the shirt, which will mean more people will want to buy it. Beyond that, the rest of it is just recording and getting my stuff ready for the release date on June 8th! You can also get your very own “No U Ain’t” t-shirts (available in all sizes, in 5 different colors) for $20 – to inquire, write me at Aaron@APTsongs.com. 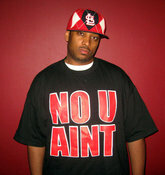 Order yours today, and help spread the “No U Ain’t” movement! I Performed! People Came! Food Was Eaten! I performed on Saturday! It was great! …and then it dawned on me that I needed to actually practice before going on stage! So, I spent two days practicing with T. Whistle (a.k.a. my performing partner-in-crime) to make sure we had the songs and stage movements down. By the time Saturday evening came, my voice was starting to go a bit, so I drank a LOT of tea and saved my voice for the performance. The crowd was energetic, the ladies were pretty hot, and by the end of each song they were all chanting the choruses – a good sign that I’m on the right path in terms of song creation. Now that I’ve performed, though, I’m actually eager to do it in some more places. It’s definitely good promo for the album – coming out June 8 – and it’s just fun to be able to get on stage and rock out! That’s all for now – be sure to join me tomorrow on uStream, where I’ll be discussing particulars of the album. I’m OUT!